Our new season on Sewing With Nancy starts this week online with the first of 26 new shows! When you hear the phrase, “Sew Big” you might think of a baby’s upright arm motion. Today that phrase gets an addendum—“Sew Big Quilt Blocks.” I naturally want to spread my arms to show the size of the blocks. Debbie Bowles, owner of Maple Island Quilts, is the designer of 18″ quilt blocks that are speedy to piece plus have great impact. Debbie has an affinity for beautiful fabric prints. Rather than cutting up the fabric into little pieces, she designs quilts using 18″ blocks. When multiplied several times, this asymmetrical big block turns into a queen-sized quilt that has drama and movement. The block is from the Big Quilt pattern. There are five sections to this quilt with a large focal fabric. Debbie used an assortment of lovely batiks for this feature. Watch Sewing With Nancy online. There are 52 programs to watch online, on your iPad, iPod Touch, or iPhone, on DVD, or soon on your local Public TV station. We’ll walk you through the fast and fascinating process. Debbie used flannel for this lap quilt. With just 12 blocks, a lap quilt can be stitched in mere hours. Several times a week we get asked for a T-shirt quilt pattern. Well, this Big Quilt pattern is ideal. June Tailor also has a new T-Shirt Transformation Ruler, which makes centering and cutting squares from knit fabrics a breeze. I found this quilt absolutely fascinating! The pattern gives an option for a half-sized quilt block. Featured below is how Debbie combined the blocks! Don’t you just adore that large floral print? So join us as we sew Big Quilt Blocks! Is there a pattern available for purchase? What’s up,I check your new stuff named “Nancy Zieman/Sewing With Nancy/Debbie Bowles/Big Quilts | Nancy Zieman Blog” on a regular basis.Your humoristic style is awesome, keep doing what you’re doing! And you can look our website about اغاني. Hi Ty, The intent of my blog on large quilt blocks was to introduce my readers to Sew Big Quilt Blocks 2-part Sewing With Nancy programs. 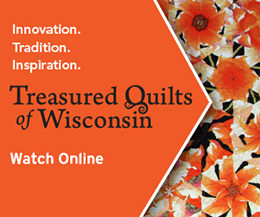 Dimensions were not included since the copyrights of the patterns belong to Maple Island Quilts. Thanks for your understanding and for watching Sewing With Nancy. Lisa, I’ll pass this information along to Maple Island Quilts, the publisher of the Big Quilt Patterns. I agree with Lisa. I would buy this today if it were available for immeidate download. I will just try to figure it out myself b/c I am too impatient to wait for a week or two to get it. This way there would be no shipping cost as well. Thanks for coming up with new and innovative ideas for people who love to sew but don’t have a lot of extra time. Love the large quilt block idea. Would like to see more ideas along the same line. Also loved the short tricks shown from a to z! Been watching your show since the beginning! I have used this pattern as a backing for other quilts. A fast way to make your quilts reversible. want to put together a lot of 8×8 inch crazy quilt blocks. Thank you for all of your ideas and inspiration. an interesting design! My email address has changed to [email protected]. These are exciting! Something new, pretty, and fun. Thank you for soothing my senses and helping me in this wonderful world of sewing since 1984. Grateful, very grateful. The T-shirt quilt solves my problem of what to do with a bag of t-shirts from my son’s gymnastics days. I like this quilt as the t-shirts are not sewn side by side. I’ve looked at other designs but like this one the best. Thanks much. Sorry, this is not about the quilt, but topics of Sewing With Nancy programs coming up. After Aug. 15th, do you have listing for topics being shown each Saturday for that series? Would be helpful to know. Jeannine, thank you for writing and watching. Each PBS stations determines their own schedule, so I never know when a series starts or ends at the different stations. The new searson, the 2700 series, was made available this week. Embarrassingly, we are a little behind and on Monday the listing will be available, telling you the upcoming topics. You’ll soon learn the next program topics. Look for an email on Monday or Tuesday. I love those t-shirts!. This will be my go to piecing for all those t-shirts I love and no longer wear. Thanks! The quilt with the large roses looks as if they are growing up a trellis! Love it………..the look and the ease in putting this together. Can’t wait for the new program. Just love your show. Great idea! The quilt looks complicated, but it’s not. Now I have a reason to buy those large print fabrics that I love.